I almost have a week behind me here in beautiful Mindo, Ecuador. Mindo is located about 1 and 1/2 hours west of Quito. As you leave Quito you climb high, high, high, and higher, you cross the center of the earth (the equator) and then you soar down, down, down, down around curve after curve until you reach (finally) this sweet little town in which I live called Mindo. 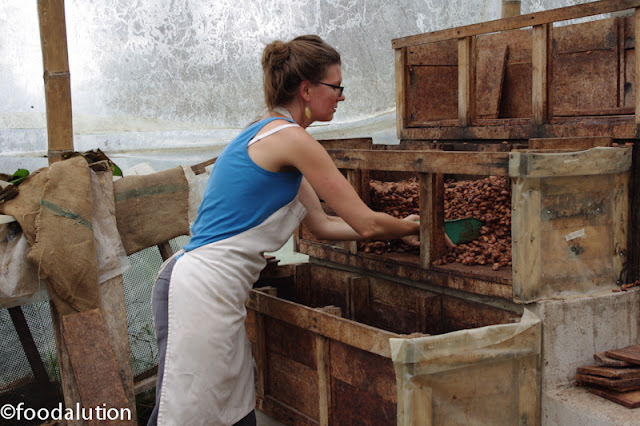 I am completing an internship at El Quetzal de Mindo where I am learning the ins and outs of making chocolate from bean to bar. I have been spending a lot of time in the fermenting room as it is where the beans really begin to take on their flavor. You walk into the warm tent and you are immediately overwhelmed with the smell of fermenting cacao, heat, and thousands of seeds set out before you on the drying racks. 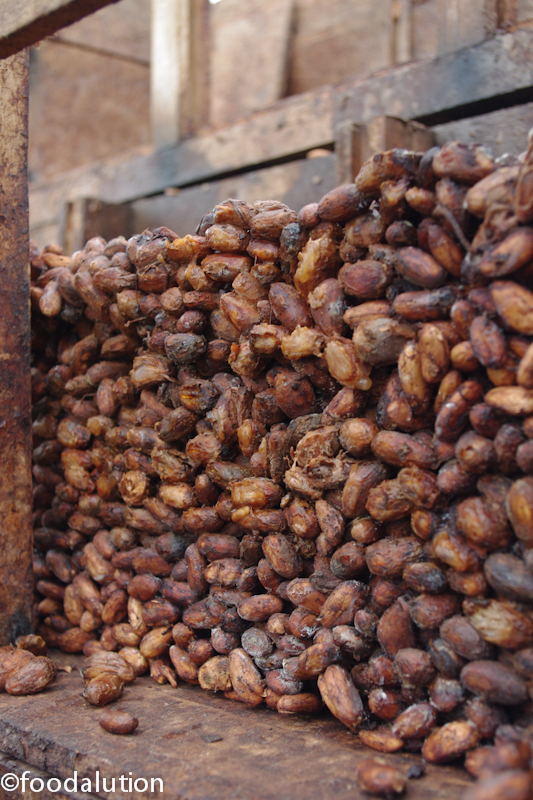 We receive shipments of cacao seeds or pepas throughout the week. 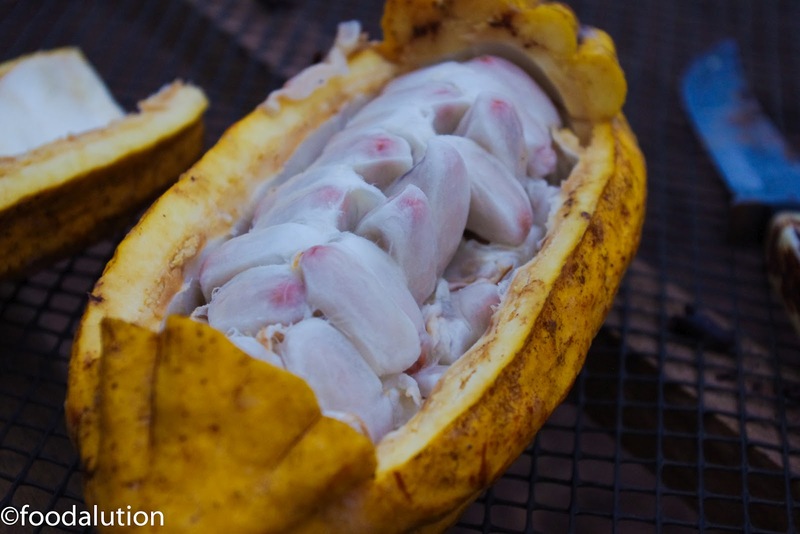 The variety of cacao we use is called Nacional, endemic to Ecuador. The pepas or seeds are weighed out and then put into a fermentation box. 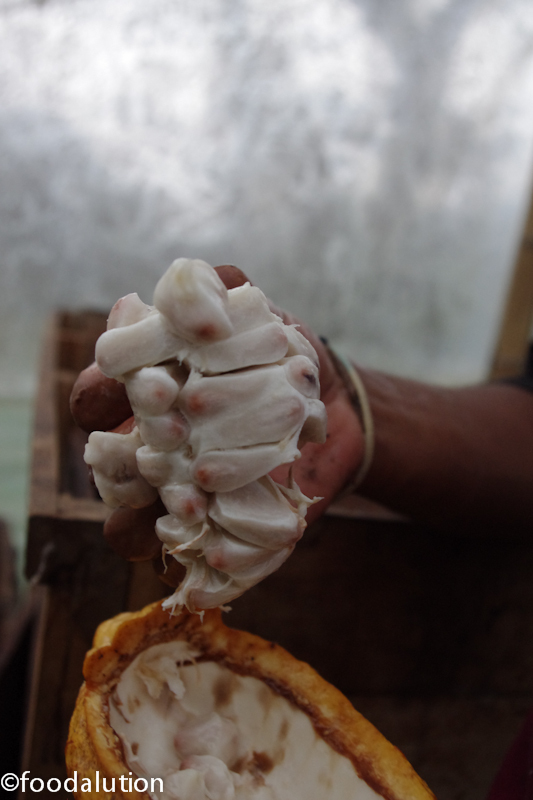 The cacao seeds have a delicious tangy sweet juicy mucilage around them that contains a lot of sugars. These sugars start to break down in the process of fermentation creating ethanol and acetic acid which aid in rendering the cacao seed infertile and also changing the flavor of the seed. During this process the cacao can reach temperatures of up to 125 degrees Farenheit. The process of fermentation also removes some of the naturally occurring tannins in the cacao. The whole science behind the fermentation is all new to me so I am quite thrilled to be learning hands on. I even have my own special batch that is currently "brewing". I gave it lots of love and extra banana leaves to help it cook! 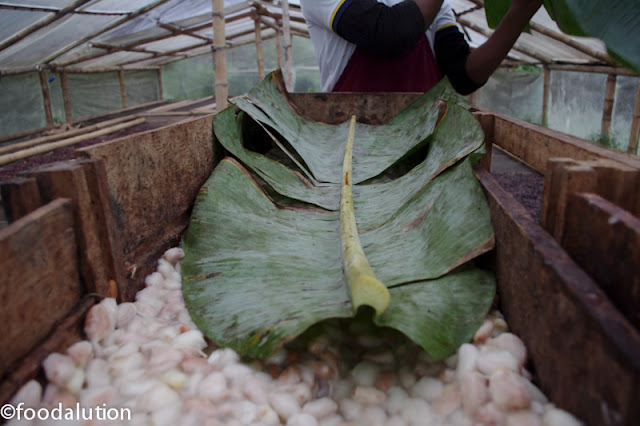 Cacao beans are placed into a large wooden box and then topped with freshly cut banana leaves, which are then topped again with a layer of burlap, plastic and wood. You would be surprised how hot it gets in this tent with all of the exothermic reactions taking place! We let the beans ferment for a total of 6 days, every two days they are moved to the fermentation box below. (see photo below) This process ensures that the entire lot of beans are aerated and the CO2 is released and oxygen can move in to complete the oxidation process. 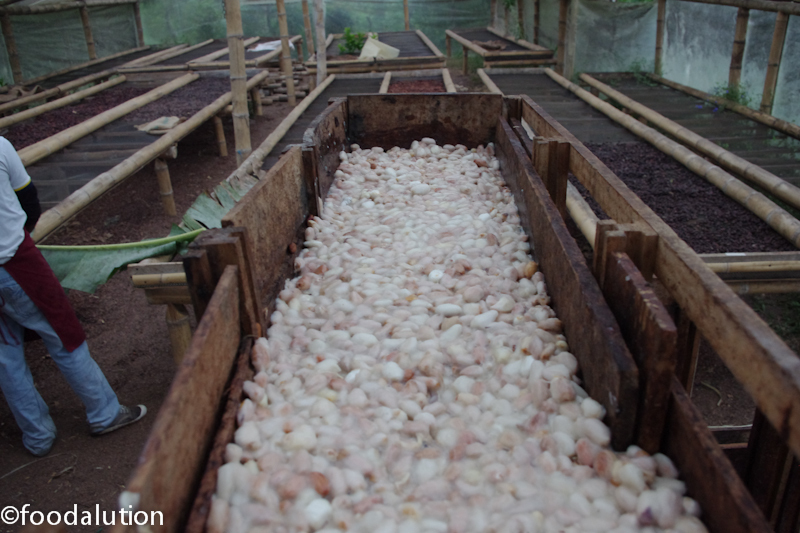 After the beans have completed this stage, they are then laid onto drying beds to finish the curing process. 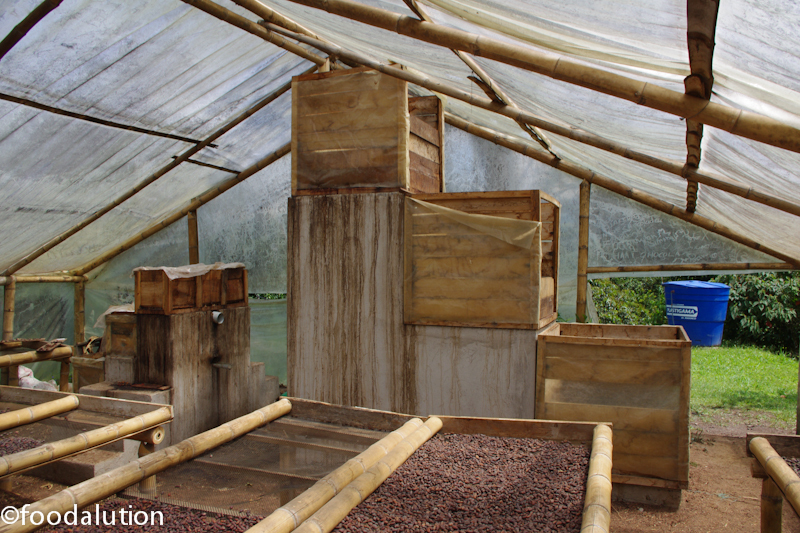 The drying process can take up to three weeks here in Mindo, Ecuador. Every day you rake the beans with your hands to move them around and separate any that may be sticking to one another to prevent mold growth and help promote optimal drying conditions. Fermenting and drying the beans are an integral part of flavor development with cacao. 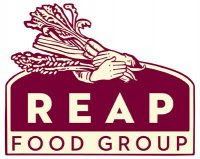 Improper fermentation and drying can cause off flavors. 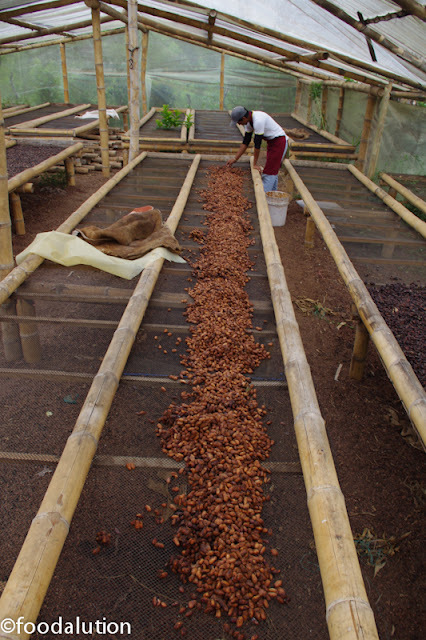 After the cacao is dried, it is taken to a climate controlled holding room before it is ground into nibs. 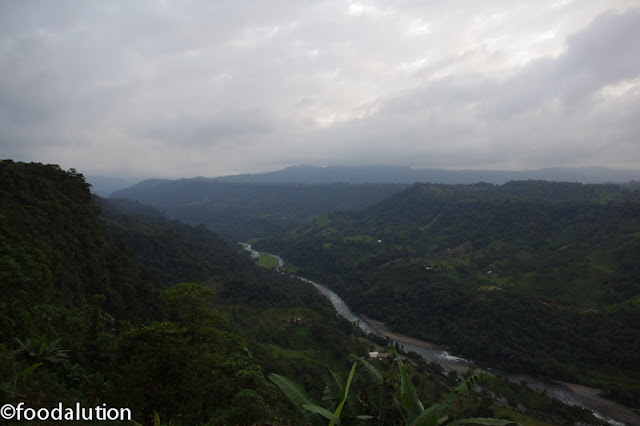 More on making 100% cacao paste soon - I will leave you with a couple of breathtaking photos of the area I am currently inhabiting. Wow! great photos Megan. Wish I were there, looks like you are learning a lot. What an awesome opportunity! Can't wait to see (and learn) a bit more from your trip! What a fabulous adventure you are having and I'm thrilled that you're sharing it with us!!! You're pictures are great and really tell the story as well as the beauty of Ecuador. Thanks SO much! 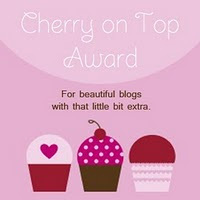 I'm already looking forward to your next post!